Disney CEO Robert Iger says the studio will “really dumb down” their next female lead, whether it’s a teenage princess or a barnyard animal. 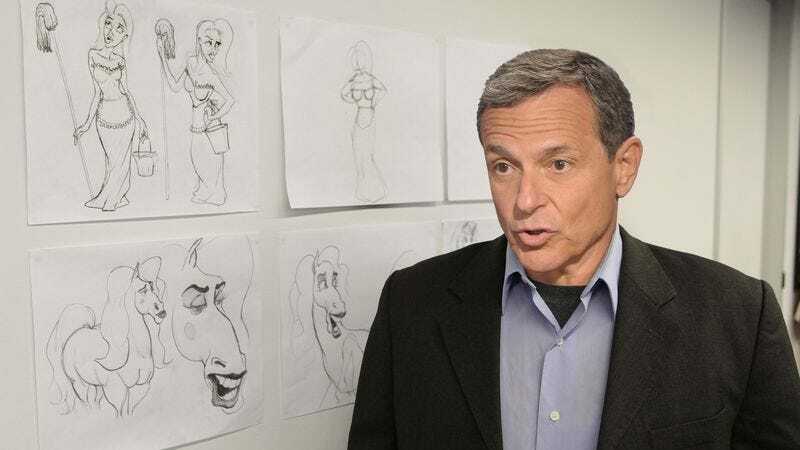 BURBANK, CA—Citing a groundswell of praise for such stereotype-bucking princess films as Frozen, Brave, and Tangled, Walt Disney Company CEO Bob Iger said Thursday his company has probably accumulated enough goodwill to make its next animated feature a real sexist one. Though still unsure whether the forthcoming fairy-tale adventure would center on a helpless Dutch peasant who splits her time between domestic duties and pining for a rich man, a vain young princess who constantly preens in front of any reflective surface, or a curvaceous, long-lashed horse who inexplicably has rouged cheeks and eye shadow, top Disney officials agreed they are well positioned to sneak in an overly chauvinistic film that exploits antiquated female stereotypes for all they’re worth. Noting that critics have given them a tremendous amount of credit in recent years for creating female leads who are plucky, self-reliant, and get by on their wits, Iger said there will never be a better time to give the go-ahead to a screenplay that hinges on a passive young woman who does nothing but wait in place for a man to come validate her existence through marriage. The CEO also indicated that churning out a story in which all the female characters are either petty, naive, vapid, or love-crazy, and in which the lone voices of reason come from levelheaded male woodland creatures or paternalistic sorcerers, would be “a walk in the park” for his creative team. According to Iger, Disney believes it now has the cultural cachet to make its most misogynist movie in years, perhaps by going back to a female lead whose life is empty, unfulfilling, and valueless until the moment she receives true love’s first kiss. While the film has yet to be storyboarded, Iger added that it is a given that the heroine will be so helpless and unable to make decisions on her own that she will require the aid of small animals to guide her at critical moments. Executives confirmed that as long as Disney’s audience is willing to bear with them on this one, a completely sexist blockbuster could prove to be a huge boon for the media company, spawning a lucrative franchise that could extend to several sexist sequels and even a degrading Broadway musical adaptation. However, Iger noted that the company’s merchandising department would be the primary beneficiary of the movie’s success. By implying to another generation of young girls that their principal value as individuals lies in being deferential, sexually desirable beings, the movie would help the company continue to cash in on its profitable line of princess-themed dolls, clothing, personal products, and video games, the CEO confided to reporters.